We are excited to have partnered up with Schatzi Wines to invite members of the wine trade to join us later this month in both northern and southern California! On the Martine’s Wines side, Remy Gresser (Alsace), Marie Luce Metaireau (Muscadet) and Ronnie Sanders (Vine Street Imports) will all be present to share their wines at these tastings. 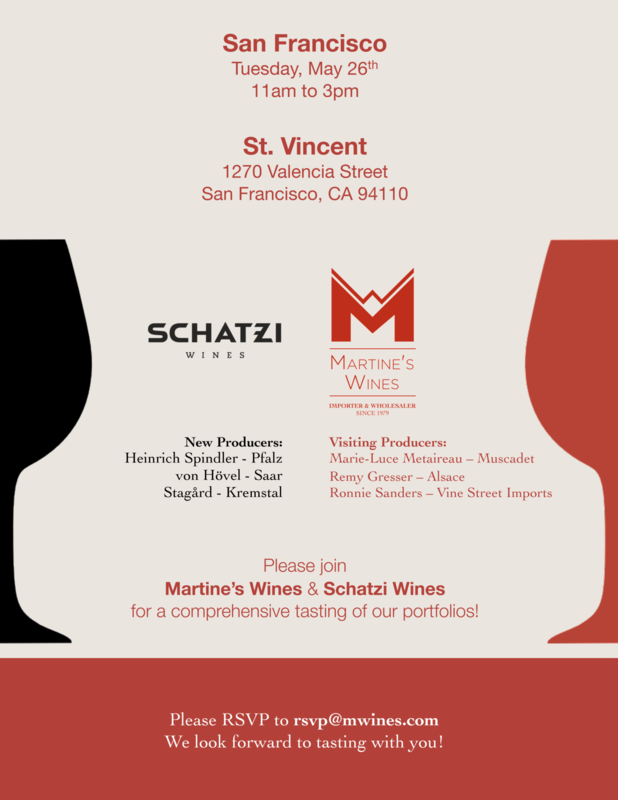 Both Martine’s Wines and Schatzi Wines will be featuring a comprehensive line up of our respective portfolios. In San Francisco, we’ll see you on Tuesday, May 26th at St. Vincent, 1270 Valencia Street, from 11am to 3pm. For our Southern California customers, please join us the following day, Wednesday, May 27th at Republique, 624 S La Brea Ave in Los Angeles, from 11am to 3pm. Don’t forget to RSVP to rsvp@mwines.com. We look forward to tasting with you! Martine’s Wines now distributing PortoVino in Chicago!